Matisse once likened a pleasing piece of art to a well-made arm-chair-calming and conducive to peace of mind. What he failed to mention was that an armchair can be a piece of art in its own right.Shapely seat-pads, traditional trimming and the precise lattice-work of webbing are all things of beauty, but properly upholstered furniture is greater than the sum of its parts. This is doubly true of pieces you’ve laboured over yourself-there’s tremendous satisfaction in pepping up a tired-looking antique or starting from scratch with a bare frame. 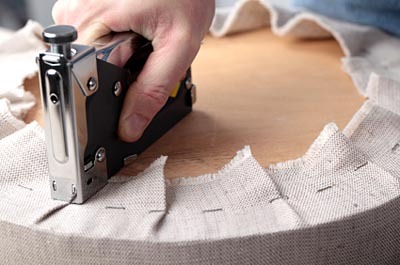 But before you start unpicking the stitching on your sofa, invest in a training course. Upholstery is architecture in miniature and, of all the skills covered in this issue, it’s probably the one that lends itself least well to early-stage, solo experimentation. Coil springs, linen scrims and bulging bags of horsehair are no laughing matter-having an expert standing by to steady your hand makes all the difference. Annie Topham and Diane Lanham of The Upholstery Workshop,www.upholsteryworkshop.com; 01722 710274) run traditional and modern upholstery courses in a bright, welcoming cottage on the outskirts of Salisbury, Wiltshire. Classes are small, with a maxi-mum of three participants, and you set the pace-you can bring along a tired but treasured piece of furniture as a one-off or enrol on the extended diploma. Five days of tuition cost £400, including home-cooked lunches and refreshments. Accommodation is available. days, Thursdays and Fridays. Participants bring their own frames or pieces of furniture and there are no restrict-ions-if it fits in your car, tutor Cherry Dobson will accept it. Five workshops cost £130, and refreshments (but not lunch) are provided. room chair. Tutor Liz Marks encourages attendees to bring cameras with them to record their progress-a nice touch. North of the border, Fife-based Walkers Upholstery & Interiors (01334 652562; www.walkersupholstery.com) offers a range of classes and courses in an 18th-century watermill. You can go in the evenings with a project or work towards an Association of Master Upholsterers and Soft Furnishers qualification. And if you need a break from stitching and hammering, there’s a nature reserve next door. Start small at The Goodlife Centre (020-7760 7613; www.thegoodlifecentre.co.uk), a short walk from London Waterloo. On the one-day Intro to Upholstery workshop (£165), you’ll be shown how to create a foam-filled drop-in seat, picking up key skills as you go. You can also opt to spend a weekend upholstering a pet bed, complete with contrasting buttons and cabriole legs. Richard Hooper, a Master Upholsterer, and his wife, Sonja, run friendly, highly regarded courses in traditional upholstery from their barn workshop. You can arrive as a beginner on Monday and leave on Friday with a fully upholstered piece (£375 for five days’ tuition, including refreshments but excluding materials). Stay at nearby Spring Cottage-rooms cost from £50 per night, including breakfast (01872 520307; www.springcottage.co.uk). If you have a particular project in mind, this is the place. Bring a piece of furniture in need of cheering up and Angie Britton will help you transform it. B&B accommodation is available (£35 per night) and you can book dinner, too. Four days of tuition cost £430, including lunches.